The full-time employees of the Ministry for State Security (MfS) made up the core staff of the secret police. In a similar way to the "Cheka", the first Soviet secret police, MfS staff saw themselves as an elite for the protection of the ruling Communist Party. The guiding principle for their activities was the "passionate and implacable struggle against the enemy" who questioned the rule of the Party. From this principle, they deduced the right to use violent and unlawful methods. The MfS used strict criteria to select its full-time employees. The main focus was on Party loyalty and the ban on contacts with the West. Staff were sworn to the strictest secrecy and subject to rigorous rules. Apart from a few civilian employees, the full-time staff members of the MfS held military ranks. They enjoyed above-average salaries and numerous privileges. 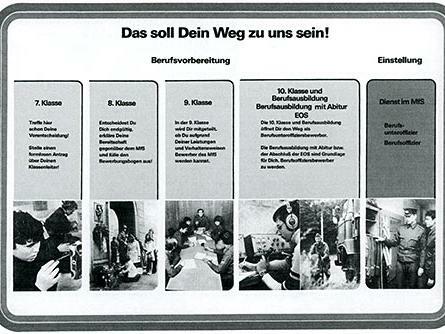 The MfS recruited its staff mainly from the Socialist Unity Party of Germany (SED), its youth organisation the Free German Youth (FDJ), the police and the armed forces. Often whole families were employed by the MfS. To fend off domestic political subversion, State Security needed more and more staff. By the end of 1952 the apparatus had grown to about 81.500 employees – which means that since 1968 the MfS had hired on average more than 3.200 additional employees per year. The MfS had largely disconnected itself from the regular planning of the national budget and financial constraints. For the MfS leaders and heads of department it was a natural assumption that there was a "great need for cadre". More and more of the MfS was becoming the political cure-all used to fight against the "hostile" influences which were perceived to be omnipresent. At the same time, the secret apparatus was developing more and more into a "closed company". It preferred to fill its enormous manpower requirements with offspring of its own employees and those of other members of the security apparatus. Material for the recruiting process between the 7th and 10th school years. Take your preliminary decision! Make an informal application to your teacher. Once you have made your final decision, make a declaration of intent to the MfS and fill out and application form. You will be informed if your achievements and behaviour qualify you as a candidate for the MfS. The 10th class opens the door for your training as a Non-Commissioned Officer Candidate.